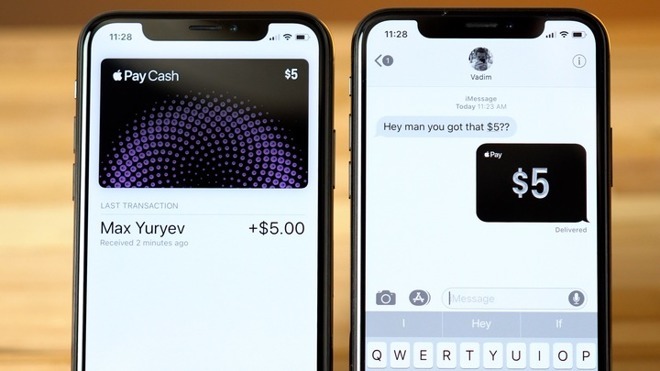 Apple on Tuesday officially launched Apple Pay Cash — a long-awaited peer-to-peer payments feature in iOS 11.2 that allows users to send and receive money from family and friends through Messages. We show you how to set up and use the new functionality in this video. 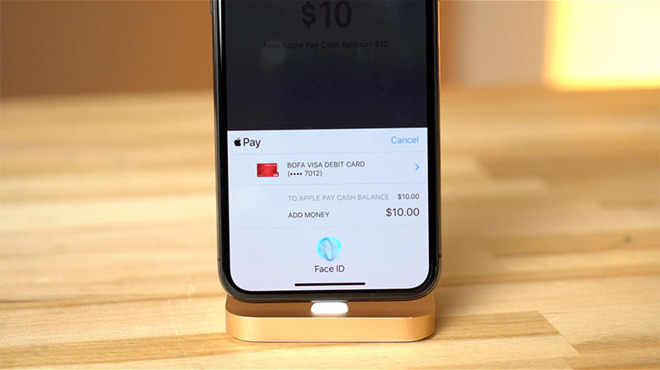 To set up Apple Pay Cash, you'll first need to enable two-factor authentication by navigating to Settings > iCloud > Password & Security > Two Factor Authentication. Follow onscreen instructions to activate the security feature. Next, head into the Wallet app. You'll see a new Apple Pay Cash card option at the top. Tap on it and hit continue to generate your Apple Pay Cash card. Alternatively, opening the Messages app for the first time after installing iOS 11.2 will display a message informing you that Apple Pay Cash is available for setup. Both options achieve the same goal: setting up your Apple Pay Cash card. Once the digital card is created, iOS will ask you to pair a debit card with the new service, and you really should, since transfers from credit cards incur a 3 percent fee. If you already have cards connected to your iCloud account, they will show up as viable options. You can choose which ones to add, or you can add a different card manually. After tapping continue, the system will ask you to verify your cards. Once they're added, your Apple Pay Cash card will now show up with a $0 balance. Now let's add some cash. If you tap on the card, you'll only get some general information, like the last transaction, so you'll have to go into Settings > Wallet & Apple Pay. From here, you can enable and disable Apple Pay Cash. Let's tap into the cash card, where you can see your latest transactions and request a statement. Tapping on info, we see an option to Add Money. Simply choose the amount and hit add. Apple Pay will now ask you to authenticate the transaction via Touch ID or Face ID. Once finished, your balance should instantly appear next to the Apple Pay Cash card graphic. Now let's send some cash to a friend. Remember that both devices need to have at least iOS 11.2 installed for person-to-person payments to work. Head into the Messages app, open a conversation with a friend, then tap on the Apple Pay icon in the App drawer. Choose the amount you want to send and tap Pay. After reviewing the payment, tap send and authenticate. Face ID on the iPhone X really makes this process easy. Your friend will receive an Apple Pay Cash popup in Messages, which they can tap on to view the transaction. They can even Request Cash again. Heading back into Wallet, your friend will instantly see the $5 added to their Apple Cash Card balance. 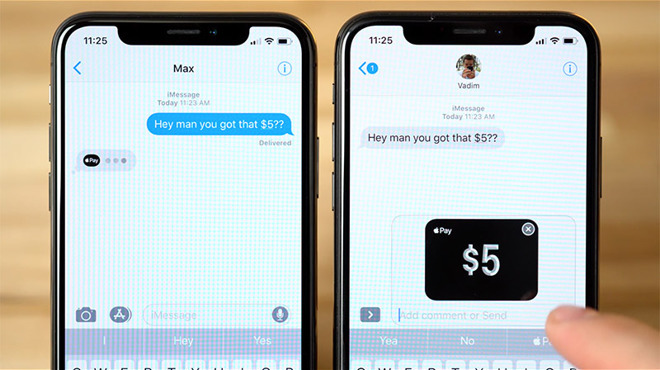 Now when your friend is the one sending you money, you'll see a little Apple Pay loading notification within Messages. Once the payment goes through, you can tap to view the transaction, and tap back to view your Apple Pay Cash settings. 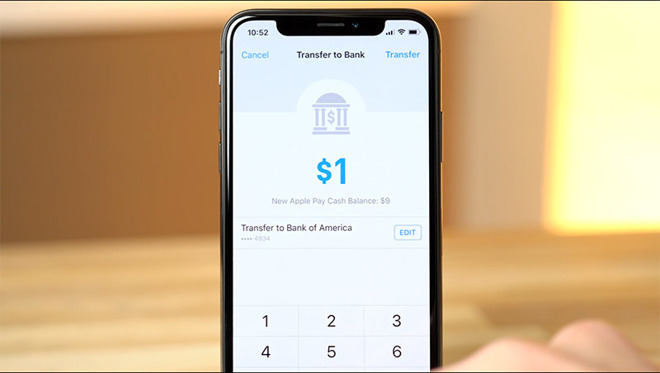 You'll have instant access to the cash for Apple Pay purchases, but if you want to transfer those funds to a bank account, tap Transfer to Bank and Add Bank Account. iOS will ask for your routing number and bank account number. You can find both numbers on one of your checks, or just give your bank a call to get that info. Once your bank account is added, choose the amount you want to transfer and authenticate. Transfers can take 1 to 3 business days, so keep that in mind. You can also set the Apple Cash Card as your default Card by heading into your Wallet & Apple Pay settings, tapping your your current Default Card, and selecting the Apple Cash card. If you ever want to delete your Apple Pay Cash card, just head into your Apple ID settings, and tap on your your device at the bottom of the screen. At the bottom of the Device Info page, there's an option to remove all cards. Finally, if you plan on sending or receiving transfers over $500, Apple Pay might require that you verify your identity. To do so, navigate to your Apple Pay Cash card in Wallet, tap on the "i" icon and select Verify Identity. You might be asked to furnish your social security number, address, date of birth and, in some cases, a photo of a valid driver's license, so be sure to have those ready.